When we did our kitchen makeover, I used one of our old area rugs under the dining table and chairs. I really wasn't happy with it because it seemed to darken the kitchen, making it feel smaller. Not only that, but the sliding glass door in the kitchen leads out to the backyard, which means my dog walks over it several times a day and he sheds like a snowstorm. His light-colored fur clumps on the dark area rug and no matter how often I vacuum, I just cannot seem to make it look clean for long. Jerome's Furniture offered me a golden opportunity to update my dining area! 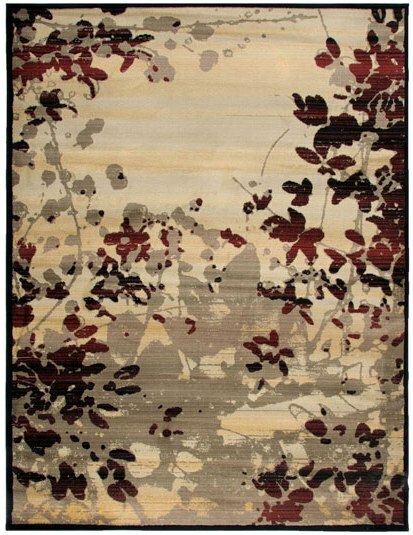 I wanted a new area rug, with the same color scheme, but with a much lighter tone. My kitchen isn't very large and the dining table and chairs sit in the middle of the kitchen, so choosing the right one is important. The Maple Falls 5'x8' area rug was the perfect solution! Rather than a dark background, it's a combination of tan and gray, with accents of the burgundy and black colors. It's still an abstract design, which I generally prefer, but the print looks almost like tree branches and leaves. We passed our old rug onto a neighbor (after vacuuming it repeatedly) and unrolled our new Jerome's area rug. The fibers are heavenly soft, almost silk-like, and cut in a very short pile style. It feels SO good on bare feet! The exact dimensions are 91" x 63" x 0.5" which are perfect for staging my round table and four chairs. It's an excellent quality rug and the edges are perfectly bound for long-lasting use. I am so incredibly pleased with the area rug from Jerome's! The new rug completely changes the amount of light in the room, making it feel bigger and brighter. Rather than the black absorbing the light, the tan reflects it. Even better, the dog's fur doesn't show up on this area rug and I no longer have to vacuum it daily! Visit www.jeromes.com to update your home with beautiful area rugs, lamps, pillows, and wall art. You can even do a complete home remodel with Jerome's living room sets, bedroom sets, and dining room sets. They've got mattresses, office furniture, and much more. Spring is coming soon and Jerome's has gorgeous patio furniture too! Shop today!